Blogger application for Android has been created by Google itself. With this simple and tiny application you can write blog posts, moderate your blog comments, check your blog stats and make changes in your blog posts. This application is highly recommended for bloggers who write short posts. Created for Bloggers using Blogger as their blogging platform. Official application by Automattic Inc. for Android users. Create, edit, draft, or publish blog posts easily. Check Blog visitor stats, moderate your blog comments and keep updated with your blog on the go. Recommended for mobile bloggers who write short blog posts.Created for Bloggers using WordPress as their blogging platform. Almost all of us bloggers love to track their blog progress. Google Analytics is a professional Analytics tool that is used by almost every blogger out there in the blogging world. With this application you can check your blog visitor stats, see ip of your visitors, track location and much more. This feature packed application is available on the Android market for free. A blogger has so many tasks to do. With this simple note creating application you can easily create a stylish note. For Bloggers who come up with a the post title anytime, they can note that post title and when they come on computer they can write that post. HootSuite is one of the best social networking application for Android users. HootSuite can be used with facebook and twitter which are most popular social networking and micro blogging sites respectively. Schedule your tweets and track click through rate of your tweets. Vikas Bhatt is a blogger, and a freelance writer. He works for sites like flash templates and Niche Bloggers. He has been blogging for more than 2 years now. Very useful list, Android has most deff. picked up on popularity! 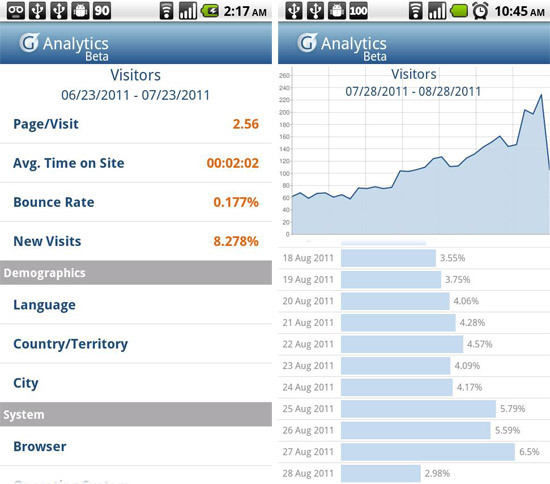 I really like that analytic s app for bloggers.. Usually i sign in to analytics from opera mini but it is irritating. yeah i also liked the analytics app, its very interesting !!!! These are certainly the best applications available out there for Bloggers, all bloggers should try these out!